I would love to live in a house with a giant handle on top. It would make life so much easier for God when the rapture comes! Will We Live in Vacuum Bottles? What is a vacuum bottle house? It sounds fantastic, but science is developing a new type of house with vacuum walls, adapting the principles of the familiar thermos bottle, which will be so perfectly insulated that one ton of coal will do the work of nine. Some day you may live in one! IN HIS fascinating book, “The Time Machine,” H. G. Wells looks forward to the day when man, in an awkward attempt to survive a dying sun and a frigid and dreary earth, will take to the ground to live like antsâ€”an idea which does not flatter the ingenuity of scientists who have been working to develop the perfect house, in which comfort is assured regardless of outside temperatures. It is extremely unlikely that the next ice age, which scientists assure us will some day return to the earth, will occur soon enough to be of personal interest to any of us. But every winter the residents of northern latitudes must protect themselves against an ice age in miniature, when cold winds roar down from the top of the “world. Why, then, have we never adopted the most perfect form of insulated house known to scienceâ€”the vacuum bottle? 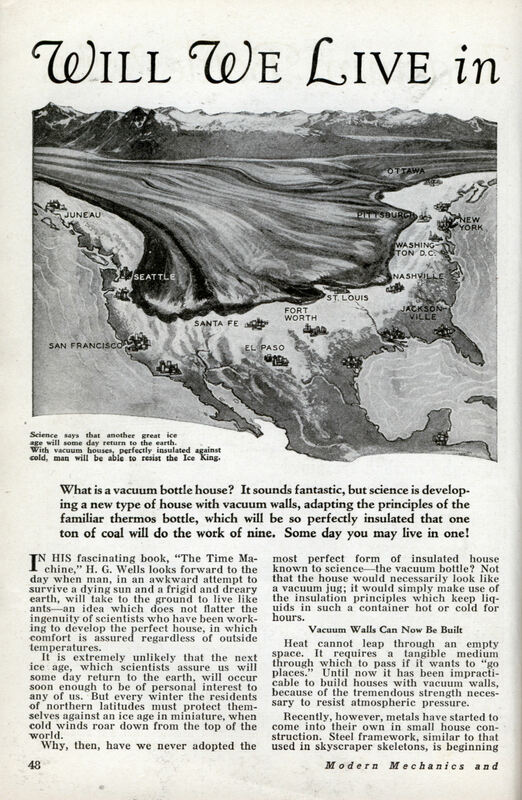 Not that the house would necessarily look like a vacuum jug; it would simply make use of the insulation principles which keep liquids in such a container hot or cold for hours. Heat cannot leap through an empty space. It requires a tangible medium through which to pass if it wants to “go places.” Until now it has been impracticable to build houses with vacuum walls, because of the tremendous strength necessary to resist atmospheric pressure. Recently, however, metals have started to come into their own in small house construction. Steel framework, similar to that used in skyscraper skeletons, is beginning to compete with wood construction for homes. Copper houses have been introduced in Germany. Concrete has long been popular. Any of these materials are strong enough for the construction of vacuum house walls. It is obvious that we must be careful in the design and construction of our vacuum bottle houses if they are to withstand an atmospheric pressure that will amount to over ten pounds per square inch (this is for a partial and not a complete vacuum). No merely double concrete wall will withstand this. Consequently the wall must be made cellular; that is, honey-combed with tiny chambers inter-connected so that air will pass freely from one to the other. A good idea of this construction will be gained from the drawing. By the use of this sort of construction, great pressure may be safely withstood and there would be no danger of a house falling victim to the relentless atmosphere. It would be utterly impossible to construct such a house so that it would not leak air. For this reason, it would be necessary to operate at all times a small, fractional horsepower motor operating a small vacuum pump. This would keep the tiny compartments emptied of most of the air and would add very little to the cost of heating a home. Calculation shows that a ten-room vacuum house might be heated with about two tons of coal for an entire winter. To do this heating with a house of ordinary construction, about 18 tons of coal would be needed at a minimum. In summer a vacuum bottle house would be as cool as it is warm in winter, since the vacuum blanket shuts out the blistering heat waves just as effectively as it turns away cold. Such a type of house will unquestionably be developed within the next few yearsâ€” long before the bleak ice age of Mr. Wells blankets the earth in snow. Yet even today we cannot ignore the ice age entirely, for science tells us that we are still living in such an age. The recent report of the German expedition to Greenland, led by Dr. Alfred Wegener, who lost his life there, furnishes striking evidence of this truth. Practically all of interior Greenland is covered with a great ice-cap, a remnant of the days when glaciers crept down from our own north and gouged out the Great Lakes. The existence of the Greenland ice has long been known, but no accurate measurements of its depth had ever been made. The Wegener expedition, however, brought back the astonishing information that the ice is 8,800 feet thick at the center of Greenland! More than a mile and three-fifths of solid iceâ€”pile eighteen Washington monuments on top of each other, and they would just about equal the thickness of Greenland’s ice blanket! These tremendous depths were measured by a seismograph, the instrument which records earthquakes. This instrument measured vibrations set up in the earth, and in this case the vibrations were artificially produced by dynamite explosions. The method was simple but ingenious. The length of time required for the waves of the explosion, traveling over the surface, of the ice, to the observer with the seismograph, is recorded. The velocity of the waves over the surface is known. A second set of waves pass through the ice to the ground beneath and are reflected back to the seismograph. By checking the difference in elapsed time, the angle of travel of the waves can be figured, and the depth of ice ascertained by simple mathematics. If Greenland is the last remnant of the ice age which has left us Niagara Falls and countless other landmarks, what are the reasons which scientists put forth to support the belief that some day the ice age will return? There are many ways, say scientists. Suppose there should occur throughout the world violent and continued eruption of a number of volcanoes. Voluminous clouds of smoke and ash would be poured from their vitals. This volcanic debris would rise in the atmosphere miles above the clouds and hang there. The sun would be obscured; its rays could not penetrate to the earth through the floating, heavy ash and dust. Shut off from the warm rays of the sun the earth would grow cold on its surface. Rain and snow falling would turn into ice. Then more rain and snow would fall. Cold would beget cold; ice would beget ice and, before many years the earth would be well on its way to icing up again. This is one of the theories, advanced by meteorologists, as to icing up in past ages. Another is that temperature conditions varied with the amount of carbon dioxide in the atmosphere. It became thinned out, permitting the heat absorbed by the earth from the sun to be thrown off without check. As a result the earth’s surface grew cold and ice began to accumulate. Once the accumulation started it would run its course. Enormous plant life may have been responsible for the thinning out of the carbon dioxide in the air. A third theory is that of shifting storm tracks over the surface of the earthâ€”of the paths of high and low pressures. The shifting of these tracks, it is held, would affect climatic conditions enough to cause large precipitation in the form of snow. This, coupled with conditions which precluded melting of the snow in summer, would result in residual layers being formed over the northern and southern portions of the globe. Another theory is that the orbit of the earth was at one time more elliptical than at present. The elongation carried the earth farther away from the sun and its polar regions became extended as a result. A quite popular theory, now largely held, is that of a different ratio existing in the geological past between the land water on the earth’s surface. It is quite well known that a great plateau exists under the sea from northern Europe via Greenland to the North American continent and that at one time the waters of the Gulf of Mexico extended far up the Mississippi Valley. Then the Atlantic and Pacific mingled their waters across the Isthmus of Panama and the Caspian sea extended northward across the low land between Russia and Siberia. Europe and North America on the west clasped hands across what is now Bering strait. Thus the Arctic was landlocked from the warm waters of the tropic and her icebergs dwelt in unmelting seclusion. So much water, so little land and that very high, precipitation was the order of things. Temperatures sank lower and lower and the ice age set in. In support of this theory scientists point to the remains of magnolias and other semi-tropical plants found far north of their local habitat today on the North American continent; evidence of warmer climates in the north than now prevail; evidence that the warm waters of the Gulf of Mexico or tropical seas once extended far up the Mississippi Valley tempering the cold of frigid north. I never hear about purposely placing dust in the upper atmosphere to counteract Global Warming. Would it require the payload of a dozen Saturn 5s…. or thousands? The first thing I can think of with a perfectly-insulated house is how all of today’s appliances and energy consumers and so on will make it really hot, really fast. With the four desktop computers in my badly-ventilated office I usually can’t stand the heat with the door closed… imagine that in an environment with no external heat transfer whatsoever! So you’d have to recast the walls if the concrete settled or cracked due to a frost heave?